Sometimes it seems that there aren’t enough hours in a day to get everything done! With busy daily life, it can sometimes be difficult to find time to make it to the gym or to a fitness class, like yoga or Zumba, on a daily basis. If you sit behind a desk at work all day (as many of us do), those hours sitting complacent can seem like a waste. One of my recent resolutions has been to learn how to efficiently utilize my time so I can have more time to spend with the ones I love. So far, these are the best products I’ve found on the web that can help you stay in shape while you work. Some of them are actually really neat! The DeskCycle Desk Exercise Bike Pedal Exerciser is extremely versatile allowing you to move it and take it on the go and works with many various sizes of desks. It’s basically the pedal part of a stationary bike that can be programmed and placed under your desk so you can pedal away. The **NEW** FitDesk v2.0 Desk Exercise Bike with Massage Bar is the latest edition model this exercise bike that features a non-slip desk for your laptop and a massage roller to make typing more comfortable. You could pedal all day long on this stationary bike desk and probably forget you’re even working out! An excellent way to workout while having to working at a computer is on a treadmill desk. The Exerpeutic 2000 WorkFit High Capacity Desk Station Treadmill is perfect to keep in your home office where you can slip on a pair of trainers and walk while you work. Need a little more room on your treadmill desk for your coffee, computer and paperwork? The TrekDesk Treadmill Desk is huge and easily connect to any treadmill! It comes complete with a manuscript holder, three-level file folder, a telephone/headset stand and even a place to put your coffee. For core tightening in order to get awesome abs, there’s the Gaiam Custom Fit Adjustable Balance Ball Chair . Sitting on a balance ball also strengthens your muscles to give you better posture for overall health. This one comes with an adjustable base that gives you a little stability so you can easily work and workout at the same time. The Stamina 55-1610 InMotion E1000 Elliptical Trainer is compact and lightweight making it easy to move around and fit under your desk. It has a cool electronic monitor which tracks the time, your strides and how many calories you’ve burned. The Elliptical Machine Office Desk. Want the full office desk elliptical? 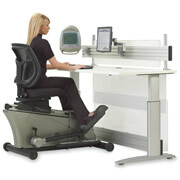 Check out the The Elliptical Machine Office Desk. available at Hammacher Schlemmer . It comes complete with an elliptical designed to be used while sitting down and has a place to mount your monitor. Seem creative and easy enough but it’s pretty pricey! The Only iPad Integrating Recumbent Bicycle. 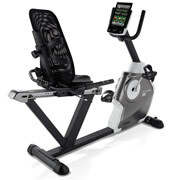 If you do a lot of your work on an iPad, The Only iPad Integrating Recumbent Bicycle. might be the best option for you. You can sync your iPad with the bike to control the exercise programs, play music, check email, etc. It’s also fully adjustable so more than one more person can use it. 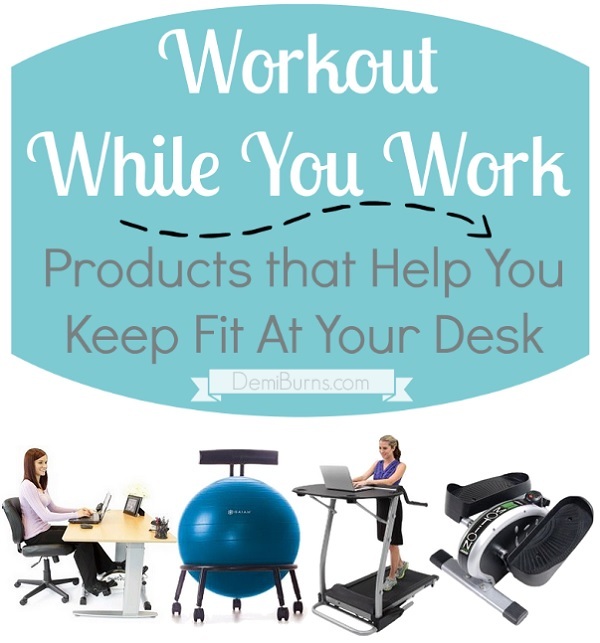 These are some really cool ideas for staying in shape while sitting at work. I would love to hear from you! Let me know in the comments… How do you stay in shape while living a busy life? *This post contains affiliate links. Click here learn more.